The answer was a resounding “no”. I loved this trip just as much and maybe a bit more than all the others. We spent lots of time sightseeing and revisited all the main places, but with Son we realised the real magic of this city is to take it slowly, look outside the tourist itinerary and be open to Paris through the eyes of a child. Contrary to what some people believe, I think it is a completely child-friendly city. All the main sights are in a fairly small area, everything is more or less walkable and for every monument, museum or main sight you want to take in, there is always a park somewhere close by. The sights and attractions are seemingly inexhaustible. From the Eiffel Tower to Notre Dame, from the Louvre to the Sacre Coeur, we managed to see them all on this trip. All are wonderful, all are worth a visit but actually for us, the best bits of Paris were something different. 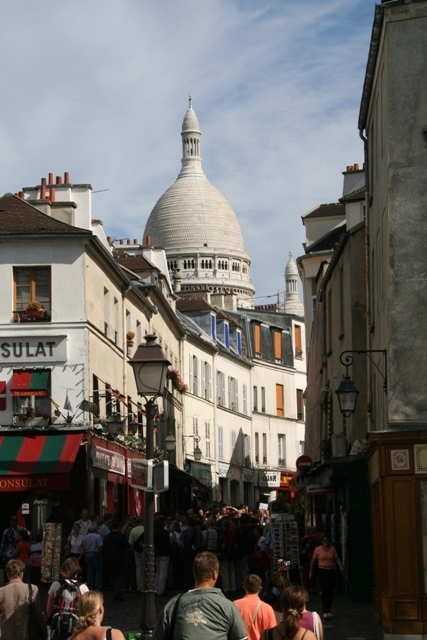 Away from the masses, we wandered around the little, winding back streets of Montmartre. We found a dodgy looking stand selling crepes and feasted on these, smothered in Nutella. We stood for ages and watched the artists at work in the Place du Tertre, taking in the bright colours and cheerful activity. In fact strolling in Paris was one of our real pleasures on this trip. The city is divided into 20 districts called arrondissements, each has a very distinct personality. We walked from one to another and loved seeing the ambiance change as we crossed from arrondissement to arrondissement. We strolled leisurely for the first time from one end of the Champs Elyssees to the other, not rushing to get to the next sight but really taking our time. We played in the leaves, enjoyed the sunshine and laughed a lot. We took a trip on a bateau mouche – a first as prior to this trip they were dismissed by us as being too corny and too crowded. Son wanted a boat ride though, so off we went and how wrong we were. It was fun, relaxing and we discovered monumental backdrops to the landmarks from the river – a whole new side to the city. While Son snoozed each afternoon in his stroller, we sat on a cafe terrace with a drink and watched the world go by. Previous trips saw us cram in as much as possible with not a moment to spare, here while he napped, we rested too. We took time to peek in “tatty” shop windows. The shops on the St Louis en Ile were a particular hit – Son loved the quirky gifts and souvenirs and we found the Maison Berthillion where we got the best vanilla ice cream I have ever tasted. 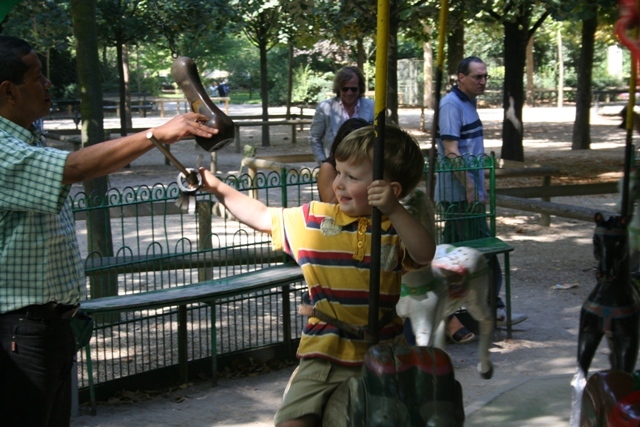 We also spent hours in the Jardin du Luxembourg, letting off steam in the playground, watching the boules games, riding the carousel and just feeling very Parisian. I always thought Paris was amongst the most stimulating cities in the world. With a 3 year old in tow, our activities and schedule were more relaxed but it was no less stimulating. If you come to Paris expecting all you have heard to be true, you will not be disappointed. This was my fifth visit, each time I have come, it has rewarded me with a varied and unforgettable experience. This time was no different. I would think that revisiting Paris with a 3 year old would actually add perspective, and many big cities are actually very child friendly, as long you don’t try to pack too much in! I’m contemplating starting a family soon, and am planning to tow them around visiting the world, so that’s what I’m hoping anyway! We’ve taken our son on our travels since he was 6 months old. You are right about big cities, in fact I think wherever you go, there is something to keep kids happy. It is also a lot of fun when you travel with children. He definitely remembers the crepes – they have become an addiction and are sought out wherever we go! As for the rest, not too sure but you never know!! I am in total agreement…we have been taking our little guys all over since they were 6 months old as well. They are now 8 and 11. They have seen a lot! I think it is all about approach. And the truth is….I think sometimes they make my trips even more enjoyable….because I am forced to slow down a little bit…maybe savor the moment more than what I would do if I were on my own. Looks like you had a wonderful time….pics are great! I agree completely Diana, it is a lot of fun with kids on trips – we end up seeing and doing so much more! My Kid loves Paris! We should really go more often, as it is only 4 hours away by train. Sometimes the places closest and easiest to get to are the ones you visit least – that’s how we are anyway!! Very true. I’m glad to read that your little guy enjoyed the trip. My Kid was crazy about the carrousels, and they were everywhere last time we were there. I’m going to ignore the fact that you just talked about a 3yo napping in a stroller while you had an afternoon rest on, well, anywhere and jump straight to isn’t it good to be forced to slow down sometimes? I’m definitely going to have to take a leaf out of your book next time I plan a trip. It sounds very relaxing. We don’t always follow this school of thought – not often enough anyway! Mostly our motto is cram as much in as you possibly can, relaxing is good though! How lovely! We were in Paris back in 2006 and will be there again later this year! Really looking forward to seeing Paris through different eyes this time! Thanks for sharing your experience – its getting us excited!!! 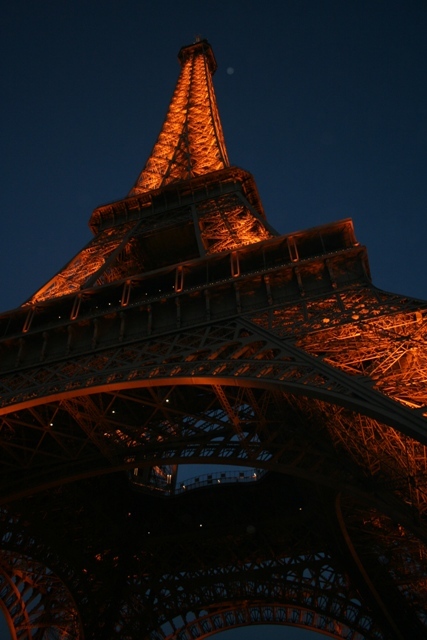 Have a great time in Paris – I’m jealous, would like to be going back this year! Thank you for those lovely pictures and thoughts on Paris. A Frenchman now living in Mexico, I’ve been looking for Beauty all over the world for many a year. Without realizing I had it there, at my feet! And whenever I go back to Paris, the first thing I do is to walk over to the Seine and lose myself in the contemplation of that unique river. Not the clearest of waters, but Beauty all the same. Thank you for reading Brian! Sometimes we take for granted the places we know so well and miss their beauty…. but it’s nice to go back and look again with fresh eyes. I love walking along the Seine too! Definitely – I loved travelling before I had my son, but with him we seem to have so much more fun! There is so much traffic for sure, but lots of parks and so much to see and do that kids really enjoy. We had a great time there and want to go back. What a lovely post. We’re planning a trip to Paris in the future with our two children and you’ve really got me looking forward to it. Travelling with children has really encouraged me to enjoy the simple things a lot more. Sometimes I can start to fret about checking things off my ‘to-do’ list on holiday, but the kids remind me it’s about enjoying the experience and the present. That’s definitely true! I still do fret about the “to-do” list though, old habits die hard….. Hope you enjoy Paris as much as we did, I’m sure you will. Your very nice story is making me more anxious about our trip to Paris this April with our son. It is going to be his first and I can’t wait to show him everything! Like you said, it will be a very rewarding visit. I love reading your stories and thank you for always visiting my blog! Best! Thank you – I love reading your blog too, the photo today was lovely! Hope you enjoy Paris as much as we did – I’m sure you will, your son will have a wonderful time. sounds so fun! Did you get to catch the puppet show at the Champs Elysees garden? No unfortunately we didn’t – won’t tell my Son though, he will not be pleased to miss that!! Oh thank you for this post!! I’m going back to Paris this summer for a month-long trip throughout Europe and I was so worried it wouldn’t live up to my memories. I can’t wait to get back!! Thank you for reading! Hope Paris is as good as you remember – I’m sure it will be!! Thank you! Another lover of Paris (like me!). what a great trip for your son. I too believe in traveling with the young ones! Yes definitely, travelling with children is a lot of fun. Paris never disappoints me – sounds like you had a great trip! Merci, too, for visiting my blog. It was wonderful – a memorable time! Oh my gosh Maison Berthillion is my ultimate favourite, I mean, even if Paris was a horrible place I think I’d go back just for that! The best ice cream ever – I totally agree! This is so great to read! We’ve just finished booking a trip to Paris with our 3- and 1-year-olds in tow. It will be a vastly different experience than when we visited on our honeymoon, but I’m really looking forward to it. I think you’ll love it every bit as much – we definitely did! Have a great trip. I visited Paris for the first time this spring – I fell in love!! It seems to have that effect! I fell in love the first time I visited, each time I go back I love it a bit more! 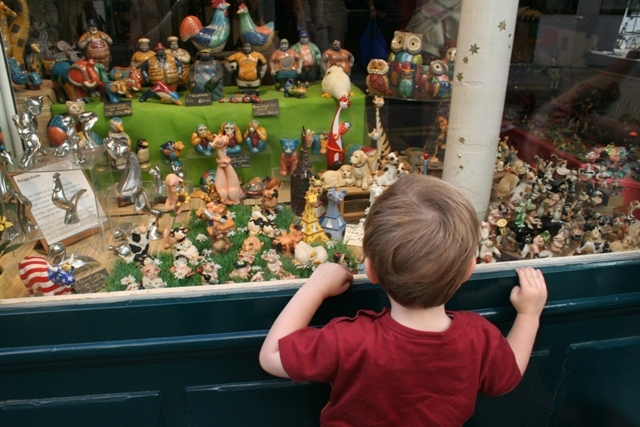 Travelling with kids is a whole lot of fun – to see the world from their Lilliputian perspective! I agree completely! It is a different experience and a lot of fun. 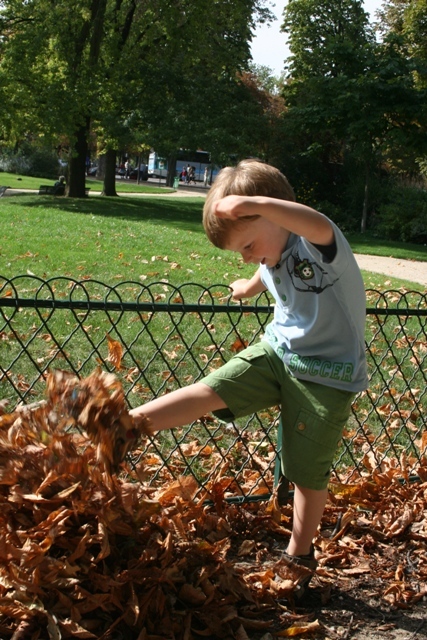 I’ve not been back to Paris since we had our 4 year old….and I’ve been missing it. We plan to go when the youngest is 3, just 1.5 more years! I loved your post, I miss those places in your photos, can’t wait to experience them with my own kids! You’ll have a great time when you go with your kids – we loved our visit with our son – we took things slower than normal but still seemed to see so much more. Love the Sacre Coeur/Montmartre and nighttime Eiffel Tower shot. Sounds like the perfect way to see Paris – just a short hop from London on the Eurostar it sounds fantastic to me! I love Paris too, but last time we went there it was for our honeymoon, no kids yet! Would love to go back there with the kids…. Yes, the good thing about travelling with kids is that we do everything more slowly. With kids, we don’t feel the need to visit every single tourist attraction in the area, and although it’s always good to have a plan, we are more relaxed about it… It’s ok to spend hours in the park and forget about visiting another tourist attraction, for example…. That way, we can enjoy the place more…. It’s a completely different experience that’s for sure when you bring kids along, no less enjoyable for all that though!! We spent our honeymoon in Paris too. Paris is on top of my wishlist! It seems really worth a visit! Thanks for the tips! (The hotel recommendation included – Is always a ‘gamble’ in a way in big cities. We loved this little hotel – not the most luxurious ever but it had lots of character and the location was absolutely perfect. 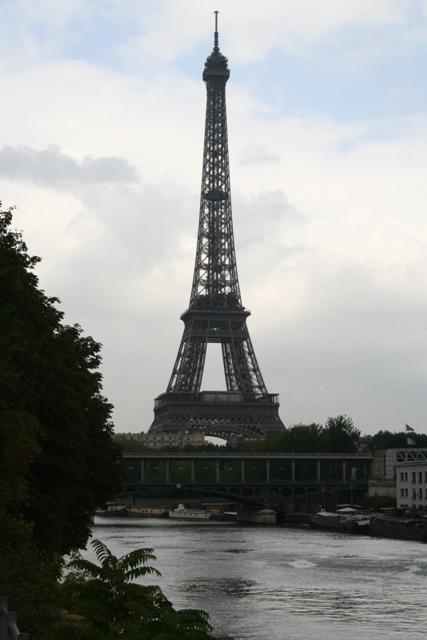 Paris is a great city to visit – so much to see and do I always love it! !